What's the purpose of a presentation? You might well think that there's a simple answer. But, of course there isn't. That's because the purpose of your presentation depends on you, the presenter. That's right. What is it that you want to achieve with your audience? And, of course, that's the starting point for some serious work. 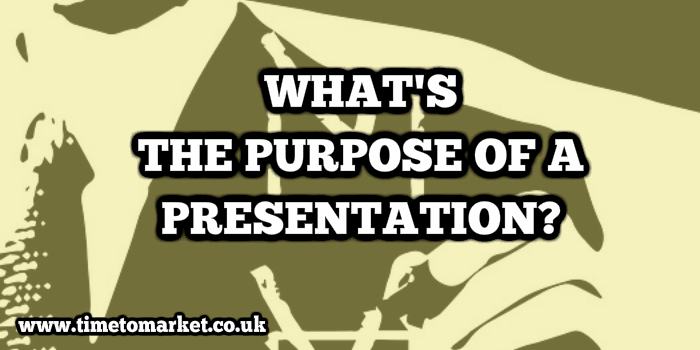 What's The Purpose Of A Presentation? Because your job is to achieve results with your audience. That's results set against your own objectives. So, what do you want to achieve? To help, you can phrase another question, along the lines of…"what do you want your audience to understand after your presentation? You plan to achieve a result with your audience, all because of your presentation. And that result is a change in their understanding. Or a change in their knowledge or beliefs. Or, perhaps your audience will choose to do something, all because of your presentation. So, that's the purpose of a presentation. It's your purpose…your objective for your own presentation. So, it's not important whether it's a PowerPoint or a Keynote presentation. Your purpose is what really matters. And, if you don't have a purpose for your presentation? Then you need one. Because without purpose your presentation won't work. Your purpose for your presentation drives everything: your points, content, theme, the examples you present and the evidence with which you illustrate your points. And, as your presentation is the best way to forge a communication with your audience, then now is the time to get cracking with a purpose for your presentation. All the best public speakers have an answer to the question, "why give a speech?" And so should all of us. You can always discover more presentation tips with our regular series of podcast and video tips. And, when you are ready for more intensive learning, then you can always join us on a presentation course or ask us to organise a coaching session. Please don't hesitate to get in touch when the time is right. "In the dim background of our mind, we know what we ought to be doing but somehow we cannot start."